I have incorporated coconut oil into my family's diet over the past couple of years. I haven't replaced Olive oil or Canola completely in my cooking--but, I have read enough valid research and scientific studies to assume that there may be at least some validity to the coconut oil benefit claims you read online. I do use coconut oil for cooking--in small quantities--and rationalize its high saturated fat content by the fact that I generally need to use much, much less of it than other cooking oils to accomplish my dishes. We also use coconut oil in our hair and skin care routines. 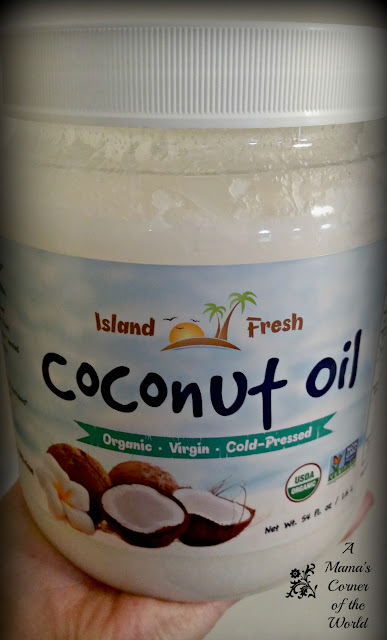 I was recently offered the opportunity to sample and review Island Fresh, Organic, Cold Pressed Extra Virgin Coconut Oil—and was excited to try it. 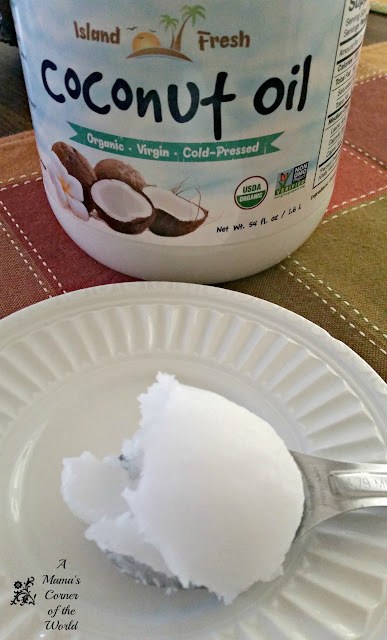 What did I think of Island Fresh, Organic, Cold Pressed Extra Virgin Coconut Oil? We sampled Island Fresh, Organic, Cold Pressed Extra Virgin Coconut Oil for a variety of uses over the past couple of months. We noted that the product remained a soft solid at room temperature in our home (around 73 degrees) and had a very noticeable coconut scent and coconut flavor. I received a complimentary sample of this product for use in my review and may receive slight compensation from affiliate linking within my posts. All opinions and views; however, are my own. In the Kitchen. I frequently use coconut oil for cooking and baking. I find that coconut oil is easier to measure as a solid--and heats more evenly than other oils. As I mentioned in my intro to the review, I tend to use less coconut oil than olive oil or butter in recipes—so a little coconut oil goes a long way. If you are used to grocery store shelved coconut oils--those are generally odorless and flavorless--unless you manage to find an organic one. The Island Fresh, Organic, Cold Pressed Extra Virgin Coconut Oil does smell and taste like fresh coconut due to its processing. While I love that the product is organic--I have mixed emotions using it in the kitchen. Organic coconut oil works really well in recipes like my chocolate pomegranate bark or subbed into an Asian themed stir fry—but, since fresh coconut is not my favorite flavor, I have to be a bit selective in organic coconut oils in my recipes. If you love coconut; however, it's a great flavored oil option as you will taste a hint of it in your finished dish. As a Moisturizer. Winter in Ohio means that dry skin becomes a constant irritation. My daughters suffer from very dry skin (especially on their knees, heels, hands and elbows). I am not a supporter of chemically laden lotions and creams—but, we do use coconut oil on their dry skin patches. Neither of my girls love coconut as a scent--but, once they saw some moisturizing benefit--the scent became more tolerable! Coconut oil is pretty thick and oily--but, this brand absorbs fairly quickly. I would just recommend using it at bedtime--then you tend to run less risk of wearing a strong, coconut scent out and about or of getting oil residue on favorite clothing. For Hair Care. My middle daughter struggles with dry, curly hair during our winter months. Conditioners either seem to flatten her curls or yield nothing positive....and quality conditioners become quite expensive. Applying just a little coconut oil to the tips of her hair during washing/conditioning helps keep her curls more manageable. The scent of this product also actually blends well with her favorite hair care products as well. What was our overall review of Island Fresh, Organic, Cold Pressed Extra Virgin Coconut Oil? I would recommend this product. It is organic and serves a variety of household purposes for us. It is a quality product for the price. I personally preferred it for use in the kitchen while my daughters loved it as a skin and hair product. Disclosure: I received a complimentary sample of this product, but all opinions and experiences are my own.